QUANTITY & DIMENSION : 4 Baksets for the price! 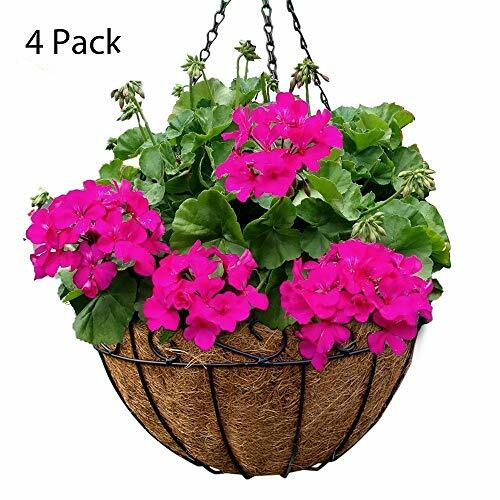 10" Diameter X 5.1" Depth for each piece,metal hanging plant basket planter wall basket wire hanging basket planter wall hanging planter basket chain basket planter basket planter liner large planter basket. ACCESSORIES : Pre-formed coco liner conveniently secured to hanging basket. RUSTPROOF COAT : Poweder coated chains and hook attached to basket hanging plants, all powder coated! Rustproof and safe to use outdoor. QUANTITY & DIMENSION : 4 Baksets for the price! 12" Diameter X 6.3" Depth for each piece,metal hanging plant basket planter wall basket wire hanging basket planter wall hanging planter basket chain basket planter basket planter liner large planter basket.